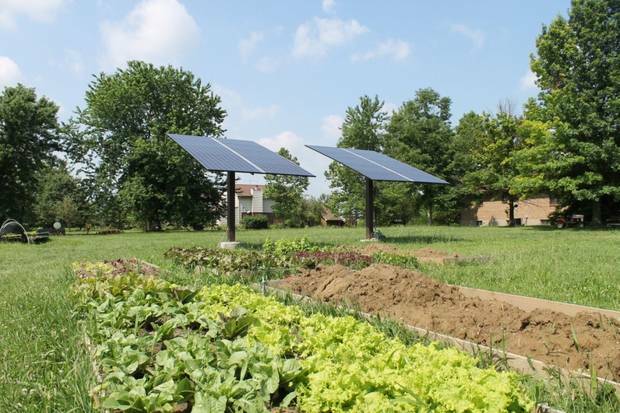 Mr. Harv Roehling of Oxford, Ohio, retired teacher of math and grower of organic lettuce and other fine vegetables, was keen to add solar electric to his list of environmentally conscious accomplishments. We’re very glad that he called us out to explain the options and bid his project! Harv wanted a 4-5kW solar electric system. A ground array was the most logical choice as the roof of his house faces east and west and his barn roof was a bit far from the main electric panel. Harv also said that he would like to be able to adjust the array seasonally for ideal tilt. We built two poles and installed them in March. On each pole we installed (10) 230 Watt REC PV Modules (PV is for Photovoltaic). We talk more about the PoleV2 here. In the garage we installed a Solectria string inverter to add sine waves (Alternating Current) to the constant (Direct Current) coming from the Solar PV mods. From there the electricity is connected to his electric distribution panel where it can be used for his needs or pushed back through the main service wires on to the grid for a credit from Duke Energy. Harv said he couldn’t be happier! We are grateful to have had the opportunity to help make his vision real! As of the beginning of July he has produced, along with his delicious lettuce, 2050 kWh of electricity from the sun’s energy. You can see more photos of the job by clicking here > Oxford, Ohio Solar Installation.